Since we've already made the "in the grim dark future, there is only Warhammer" joke this week, I will instead say simply that there is yet more Warhammer on the way. Man O' War: Corsair was announced today as a "game of high adventure, naval combat, and exploration" based upon a Games Workshop tabletop game set in the Warhammer Fantasy universe. Let the record state, there really are quite a lot of Warhammer games on the way to your PC. To be scrupulously fair, we are talking about Warhammer Fantasy, Warhammer 40,000, and various spin-off properties like Battlefleet Gothic, Space Hulk, Mordheim, and even Blood Bowl. 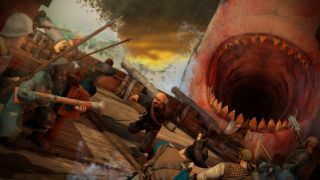 But they all fall under that great Warhammer umbrella, and so does Corsair, which will combine exploration and trading with "frantic naval action" featuring conventional armaments, flashy magical, and fantastical creatures. "A captain in Man O’ War: Corsair can sail the coast of a huge continent in the Warhammer world. Visiting over 50 ports from Erengrad to Saratosa, the sea is yours to explore," the Man O' War: Corsair website says. "A heroic adventurer does not only have enemy ships to contend with. The deep and unexplored oceans hold terrifying creatures that few see and live to tell the tale. These deadly creatures emerging from the deep sea will chill blood and drop jaws in equal measure. The wise would attempt to flee but those brave enough to tackle such creatures will be famed throughout the world." That sounds like it might be fun, doesn't it? Sid Meier's Pirates!, but with Orcs, Elves, Dwarves, Skaven, Chaos, and great white sharks the size of jumbo jets, is a game I think I'd like to play. Man O' War: Corsair is slated for a 2016 launch. Find out more and sign up for the mailing list, if thar be your interest, at manowarcorsair.com.